Washington Capitals Game 81 Re-Cap: Caps win, and they’re in! It took a little longer this season than in years past, but the Washington Capitals, in their next-to-last game of the regular season, finally qualified for the Stanley Cup playoffs as a result of holding on to beat the Florida Panthers, 4-2, and the Buffalo Sabres falling to the Philadelphia Flyers 2-1 just up the road. The loudest cheers of the night from a raucous Verizon Center were saved for the announcement of the Sabres loss in the third period on the video board. In fact, with a Caps win over the New York Rangers and Panthers regulation loss Saturday to Carolina (Florida is 2-3-5 in their last 10), they would take their fifth straight Southeast Division title. The Caps can finish with the third, seventh or eighth seed in the conference, depending on the results of the last regular season games Saturday night. The victory, however, came with a very steep price tag. With the Capitals leading 1-0 on the strength of a Jay Beagle rebound goal, just 5:39 into the second period the Caps lost the services of goalie Michal Neuvirth with an apparent left leg injury after Panthers forward (and former Capital) Marco Sturm fell on the goalie’s left side, twisting Neuvirth awkwardly as he tried to get his left leg out from underneath of him. He could not get up as the puck remained in play, and with the eventual whistle the Caps trainers came onto the ice to help the netminder to his feet. The trainers helped Neuvirth off the ice and down the tunnel to the team’s locker room as Neuvirth was unable to put any weight on the leg. Of course, with Tomas Vokoun already on the shelf, were Neuvirth unable to play Saturday the Caps would likely call up Dany Sabourin from AHL Hershey to back up Braden Holtby, who stopped 12 of 14 shots he faced in relief of Neuvirth. After Neuvirth exited, the Caps started playing like gangbusters, hitting everything in sight. The pressure paid off handsomely, as they lit up Panthers goalie Jose Theodore for two goals in two minutes. Alex Ovechkin followed a Marcus Johansson shot into the slot and banged home the rebound past a sprawled out Jose Theodore (20 saves). Two minutes later, Brooks Laich put his money where his mouth is, sending a rocket past Theodore to give the Caps a 3-0 lead. At that point, Florida coach Kevin Dineen lifted the embattled Theodore in favor of backup Scott Clemmensen. But at the next television time out, Dineen put Theodore back in. The maneuver seemed to work as Florida got a little spark, coupled with the Caps defensive posture. The Panthers clawed their way back into the game, with Mikael Samuelsson ripping a blast past Holtby to cut the led to 3-1 with under five minutes in the period. That lead was cut to one a mere 42 seconds into the third period, as Ed Jovanovski managed to float a knuckleball from way downtown past Holtby’s outstretched catching glove, much to the chagrin of the Verizon Center faithful. The Caps scrambled through much of the frame, but when the Caps Entertainment Team put the Sabres score on the video board a little more than half-way through the period, the crowd erupted knowing if the Caps could hang on, a playoff spot was secured. Hunter professed to not looking up at the video board when the score was posted. Whether the team fed off the fans’ eruption or not is hard to say, but their play did pick up in the late stages of the period knowing what was at stake. With 3:06 left in the game, Marcel Goc clipped Nick Backstrom up high on a forecheck, giving the Caps a two-minute advantage. The Caps seemed content in simple killing the two minutes off the clock, which they accomplished. But four seconds after Goc was released from the box, Alexander Semin struck from a short angle off Theodore for the clinching insurance goal and the place erupted again. 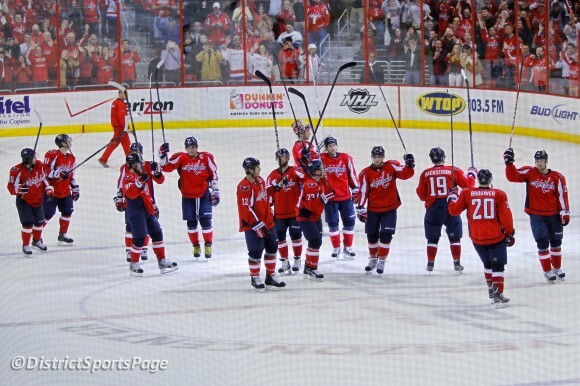 This has been a trying year for the Washington Capitals. They got off to a great start, then underperformed enough to get their very popular coach fired, the General Manager convinced the team had tuned him out. They brought in one of the Caps “Rushmores” to instill some toughness and character, yet for the most part the malaise continued to linger as the Caps would often take a step forward only to then take another step back. They’ve looked at times like they could get hot and dominate for a stretch, then the next game they’d choke away a three-goal lead like it was their job. They’ve been frustrating, maddening, confusing and heartbreaking. But all that is immaterial at this point. In the Stanley Cup playoffs, anything can happen. I’m certainly not trying to imply that something magical will take hold of this team and transform it just because they’ve made the playoffs, especially if Neuvirth is seriously injured. But at least they’ll have the chance.